Politically conservative groups have never seen much support from other investors—last year garnering just 2.5 percent on average for eight proposals—and they often submit their resolutions without adhering carefully to the shareholder proposal rule, encountering technical difficulties that mean their resolutions do not make it into proxy statements. 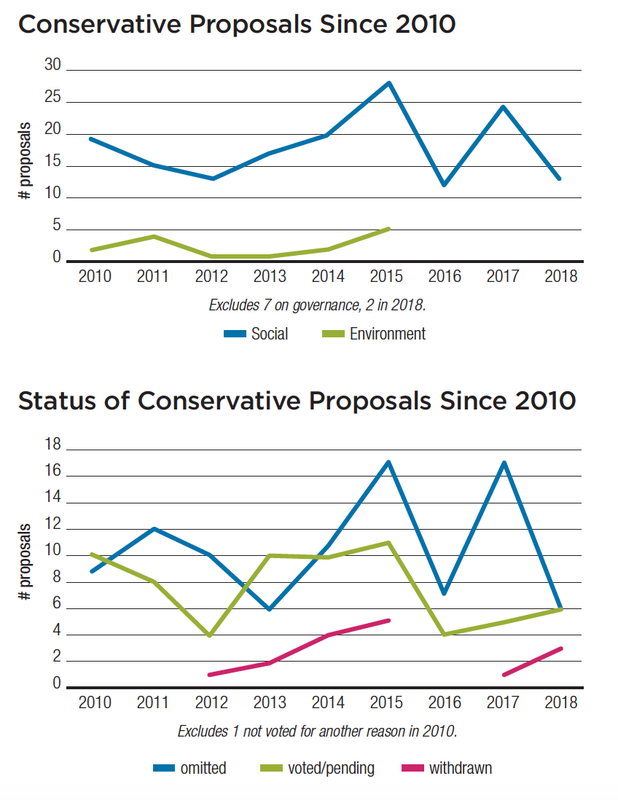 Nonetheless, they continue to pursue conservative aims that largely have been about social policy (top chart). The final resolution tally of conservative-backed proposals for 2018 remains unclear as of this writing; NCPPR does not respond to Si2 inquiries for information. Information about NCPPR resolutions often surfaces in company challenges filed at the SEC.